What do you do when Halloween is over and you have a lonely pumpkin rotting on your doorstep? Here are 5 ideas of what to do with your leftover pumpkins before they turn to mush. 1. Toss your pumpkins in the compost pile. Just be aware you might have another pumpkin growing next spring! I've also read you can bury your pumpkin to fortify the soil. Has anyone tried this? 2. If the pumpkin still looks good and hasn't rotted yet, bring it in the house and cook it up. You can bake it in the oven, cut side down, at 300 degrees for about an hour or until soft. Some people add a little water on the bottom of the pan to keep things moist, but this is not required. Once it's cooked, you can scoop out the insides to use in recipes like pumpkin bread or pumpkin pie! And if I haven't said it enough before, these two recipes are to die for! So, so good. 3. Another thing to do if your pumpkin is in decent shape is scoop out the seeds and toast them up. Click here for a recipe! Pumpkin seeds are a great source of zinc and magnesium. 4. Donate them to a local pig farm. We have one near me that takes pumpkins for their pigs. What a treat for them! 5. I haven't tried this one yet, but I went to a wedding where the pumpkins stood in as vases. The insides were scooped out and filled with beautiful fall blooms. My favorites were the multicolred sunflowers. I may have to try this one! 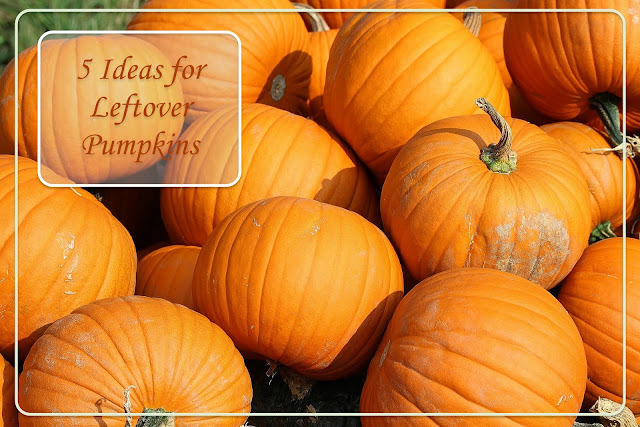 Do you have any other ideas for what to do with those leftover pumpkins? Let me know in the comment section below. And remember I'm participating in the Ultimate Blog Challenge!